The way children behave at school has been given lots of media coverage. It is an issue that can really blight progress but there are things that you can do to make sure it is not a problem for your child. One of the policies or documents that you are likely to be given when your child goes to school is the school’s approach in managing behaviour. It is likely to consist of a list of rewards for appropriate behaviour and sanctions for when the behaviour is disruptive or likely to cause harm whether to the child or someone else. In order to support your child and hopefully prevent them from being on the wrong side of the behaviour line, make sure they understand what constitutes appropriate behaviour. Schools are very good at making rules and assuming that children understand them. It is not done intentionally but can cause distress especially if it happens early in the child’s career. If things do go wrong, always try to talk to staff as soon as possible after an incident so that the facts can be gathered. Make sure you follow the procedure that is outlined in the policy. It is very understandable that you will want to champion your child’s case but losing your temper does not help anyone particularly your little one! Do follow things up. Let the school know if things have improved as well as when they need further investigation. 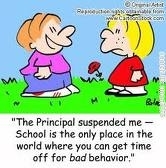 Good management of behaviour is definitely where school and home can work successfully together!